I skedaddled out of T or C toward camp; once I was almost there I decided camp could wait, but adventurin' couldn't. I headed toward Engle for no particular reason. I am 101% certain that the road south out of Engle was dirt last time I was there (during the Flood of '13). Or it was underwater. Either way, it was not the smooth, paved number I found this time. Once I saw how easy life could be, I turned right on Upham Road (A013) and headed generally toward Spaceport America. Upham Road parallels, and sometimes is Jornada del Muerto (Journey of Death). These days, you're cruising with a Circle K Cola of Death, so it's not so scary. Unless ... but, I'll get to that. I approached Spaceport America and found a guard shack, so I paused. Go on up? Move on past? I rolled up and asked if I could just take some pictures. The friendly guard assured me I could, after he ran my driver's license. I parked and headed for the fence. I wasn't clicking very long (30 seconds) when a Jeep pulled up - the driver, Tim, very urgently insisted that I get back on the pavement. He explained that rattlesnakes here don't rattle anymore. He thought I might be on my own Jornada del Muerto. I got back on the pavement just to make him happy. While I had him there, I asked a question, and so he got out and started telling me stuff. "I've been here long enough - I can give you the $70 tour." He explained the perfection of this geographical area for rocket launches: its elevation, corridor to the Gulf of Mexico, hauntings ... but I'll get to that. James Doohan's ashes were sent into space from here. Tim told me about the tarantula hawk, the oryx, the silent rattlers, the ghosts ... but I'll get to that. The facility is self-contained. Almost everything is solar-powered. Waste is treated on-site. 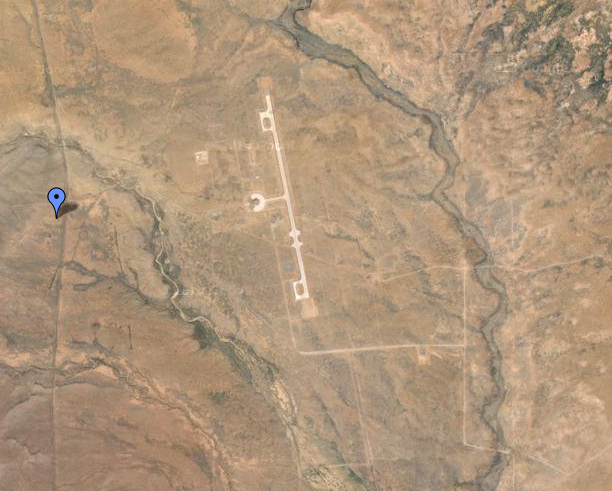 There is a 2.5 mile runway that is not visible except from above. Bernardo Gruber (El Alemán - "the German") was a trader who traveled this way in the 17th century. Maybe he died from lack of water. Maybe he was another victim of the Spanish Inquisition (they apparently "inquired" heavily here, too). He was suspected of witchcraft, and may not have realized how strong the Catholic influence was in the New World. After all, no one expects the Spanish Inquisition. Does he haunt Spaceport America? My guide believes. He has seen too much, he said, to be a skeptic any longer. Rattlesnakes that don't rattle?..No Quacking way!..This would be on my list of places not to visit, if I had any lists at all.. This post is way kewl! I love space stuff. And ghost stuff. Okay, you made me look it up. It's true, rattlesnakes don't always rattle before they strike. It would be hard to catch prey if they rattled and warned them. Let's hope if a rattlesnake sees or hears a person coming they will make lots of noise so we stay far away. Oh, on the positive side less than a dozen people in the US are killed by rattlesnake bites every year. That's one lottery I don't want to win! I hear you, Gail. I've also read that a huge majority of rattlesnake bites involve youth and alcohol. One out of two makes my odds twice as good. Page, there can NEVER be too many Monty Python references. And, thanks! UpD, I prefer my snakes to use their voices, too. Maybe if I don't look too mousy or ratty they will give me more warning. Beautiful photos. Spaceport America sure looks futuristic, but blends well into the landscape, I like that. Rattlers don't always rattle, good to know that for next winter, I will keep that in mind. I am FREAKED out. Rattlesnakes and ghosts - two of my biggest anxiety producers. I nearly jumped out of my Jammie's when you said Boo. You scary duck you! MG, you were so brave to read all the way through to the "boo"! Bea, I like the way it doesn't jut up and out and make itself obnoxious to the eye. Actually, the apparent reason many of the rattlesnakes don't rattle is a genetic defect. This short vid talks about it in a different species and location - but it's the same basic idea. https://www.youtube.com/watch?v=ubTtNiq-jSg I used to live near the red building you can see in your photos. It is a really magical place. Too bad the Spaceport basically ran almost everyone out and are threatening the diehards who stayed with eminent domain. And we're still waiting - seven years later - for that first commercial launch of space tourists. Very interesting, Summer! I wonder if that's a convergent thing, where different populations have amplified this trait separately. It does seem like an advantage to them not to rattle.